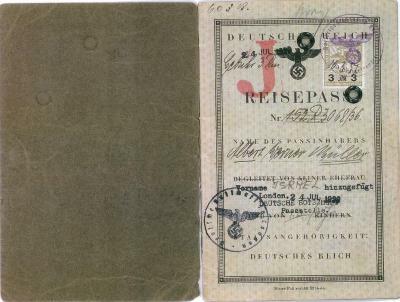 German passport belonging to Albert "Al" Miller (Muller). This passport was a new issue, 1938, in order to make it valid. Issued at the German consulate in London, England. "Israel" was inserted into Al's name because it was law in Germany that all Jewish males were to have the name "Israel" added to their name.